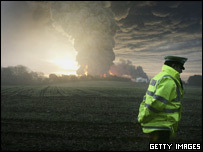 The Buncefield fuel depot that has been rocked by explosions is co-owned by global oil giants Total and Texaco. Located near Hemel Hempstead in Hertfordshire, it supplies petrol and other oil products to the wider South East and London regions. In addition, it provides aviation fuel for a number of airports, including nearby Luton and Heathrow. Although Buncefield is a main facility, petrol firms and the airports insist there will be no supply shortages. The official name of the core Total-Texaco facility at the site is Hertfordshire Oil Storage Terminal. First opened in 1968, it employs 16 people and is the fifth largest such depot in the UK. It handles some 2.37 million metric tonnes of petrol and other oil products a year, filling 400 tanker lorries per day. The petrol and other products are pumped to the facility by an underground pipeline from the Lindsey Oil Refinery on Humberside. This pipeline was completed in 1990. A further pipeline then continues directly from Buncefield carrying aviation fuel to Heathrow. The wider Buncefield site is also used by BP, Shell and British Pipeline. French-owned Total is the world's fourth largest oil company. Texaco is part of US group Chevron, the fifth biggest. "We are doing everything we can to support the emergency services and to bring the situation under control," said a Total spokesman. "Firm details of the incident are not yet known. Our first priority is to ensure the safety of all those affected by the situation." It is believed at this stage that the explosions were the result of an accident.